Small make-to-order manufacturing companies usually don’t have a PPS system planning their orders and tasks automatically, since their manufacturing process is not standardized enough or their order volume is too low. Often, they plan their orders and allocations intuitively. This planning strategy works fine as long as the order volume is low. With the number of incoming orders increasing, however, these companies seek support in a planning board that allows manually allocating orders and at the same time provide an overview of the orders in the manufacturing process. For these companies is it that we develop tailor-made interactive planning tables with an integrated pool of orders or order backlog which allows to simply drag and drop the orders and tasks to the resources. There are different ways of visualizing such a backlog that depend of the manufacturing process and the planning focus. Together with our customer Dickies, who has to place embroidery orders on their machines, we have developed this visualization version. By context menu or by drag & drop the planner allocates the not allocated orders to a machine. The order having been allocated by context menu automatically queues up at the end of the orders waiting at this machine and can also be moved from there, if necessary. It is also possible to place a not allocated order by drag & drop at a certain place in the queue directly – e.g. between two waiting orders. The list of the not allocated orders can be filtered/sorted by several criteria. Read more in our success story. 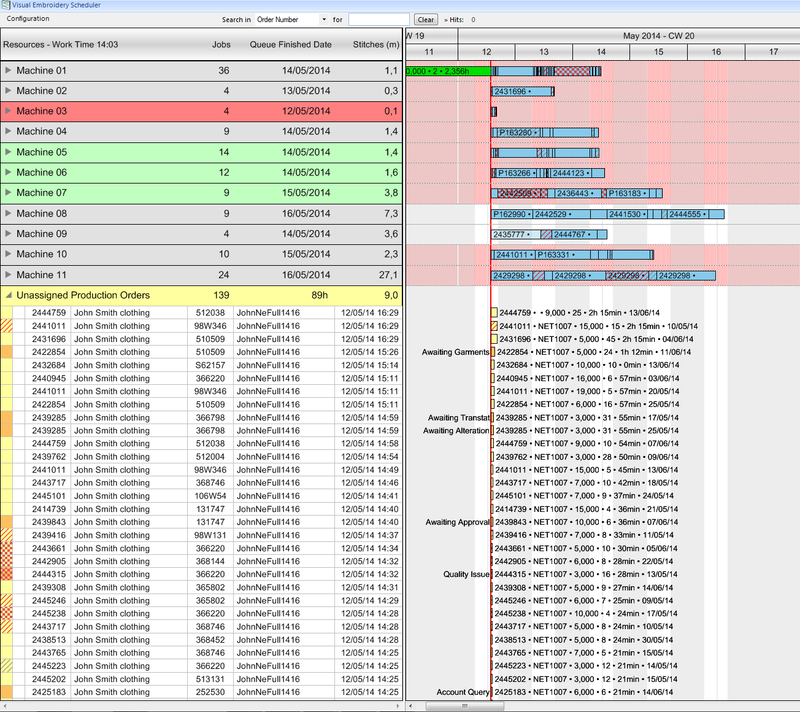 If orders have quite similar processing times or only short durations, it could be reasonable to place a Gantt chart with a backlog below or above the allocation plan. For instance, the not allocated orders will be placed on the response date if the planning focus is upon this date. In this case, employees’ deployment will be planned that are always booked for a certain day. The advantage of this visualization form is the comfortable drag & drop handling. The planner moves vertically, upwards or downwards as fast as possible, to the selected resource, very closely keeping in view the date the order is focused on. Orders with several sub-orders can very well be presented in a tree structure that visualizes the hierarchical structure of the single orders. If the structure is collapsed, the planner sees the number of not allocated orders at one glance. If he expands one of them, the belonging sub-orders can easily be moved to the Gantt chart by drag & drop. Visualizing a backlog in a table is quite similar to the tree structure but in many cases this form is better suited. In a table, the order with its sub-orders can also be displayed in hierarchical form. However, a table offers one crucial advantage: It allows to display much more information on the orders to be planned and in a much clearer manner. Moreover, filters are available that let the planner list orders in the backlog by certain criteria. If intermediate products have to undergo different control tests, the orders can be filtered by a certain test regulation so that they can run in a row preferably. In this sample resource A is one machine, resource B is a group of machines, that can excecute the operation in parallel. The application includes a function that splits the operation automatically to optimize the use of capacities.